DMG Pack of 12 Tempered Glass for Samsung Galaxy Core 2 / G355 + Flexible USB LED Bright Light@949 Rs [Mrp:-949] - Onlinedeals.discount - A leading product discovery website. Find the true prices of products, read reviews and buy top brand products at reasonable prices. Ultimate Scratch Protection: Premium tempered glass effectively resists scratches thanks to its 9H hardness rating (harder than a knife). Package includes a a fairly useful bright LED light which can be plugged into any USB port and provides you with a mini torch option in time of need. Protect your Samsung Galaxy Core 2 / G355 from knocks and scratches, every single time with our tempered glass screen protector. With an industry-high 9H hardness (harder than a knife’s blade), this protector is virtually impossible to scratch, whatever you whack against it. Precisely cut to cover the entire flat surface of your devices screen, keeping the earpiece speaker, camera, light sensor and home button totally unobstructed. Transparent, paper-thin and sporting an anti-smudge coating, enjoy your original HD display and high-response touch. 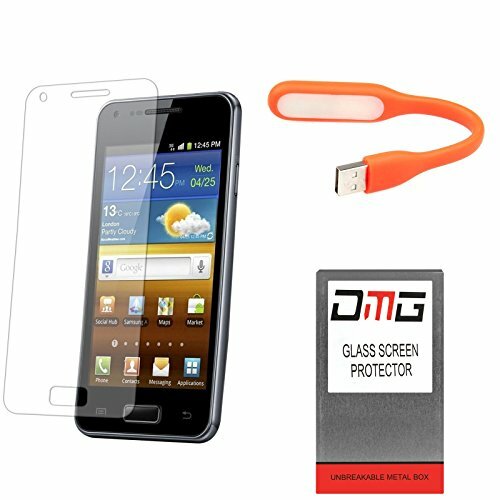 Pack of 12 Premium tempered glasses makes this screen protector much smoother than the cheaper plastic alternatives. Fingers glide across just like your original glass screen. Package includes a a fairly useful bright LED light which can be plugged into any USB port and provides you with a mini torch option in time of need.